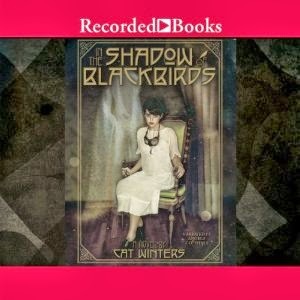 I'm happy to announce that the In the Shadow of Blackbirds audiobook is now available from Recorded Books. The publisher's website contains ordering information for school and libraries, and Audible.com has purchasing info and listening samples for everyone. The audiobook is narrated by Angela Goethals, who narrated the Sisterhood of the Traveling Pants series. She has also appeared in movies such as Home Alone and Jerry Maguire and on TV series such as 24 and Law & Order. I've listened to the sample and think it's amazing. Congratulations! I rarely listen to audiobooks, but one I did was the Sisterhood of the Traveling Pants. My mom and I listened to all of them together, and loved them! Angela has a wonderful voice, it just sweeps you away into the story. Thank you! I've never listened to the Sisterhood of the Traveling Pants audiobook, but I was thrilled when I learned my novel would be given the same narrator.